Cayuse has received seven original lithographs by Tillman Parker Goodan, all in handmade frames by Jeff Vest of Jackson Hole. Best known for the design of the still-popular “Rodeo” and “Boots and Saddles” china from Wallace, Goodan’s work was appreciated by many in early Hollywood. Goodan grew up ranching, and would create art in between rodeo events. He studied with noted California landscape artist Dana Bartlett, but decided he wanted to keep his cowboy life, and devoted his artistic bent to scenes from what he knew. He eventually caught the eye of Gene Autry, illustrating his books and comics. 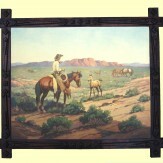 Goodan was a true cowboy artist, and died in the saddle during a rodeo parade in 1958.